My apologies for not blogging in a while. Life gets busy with 5 children, 2 cats, & a dog! I’m still collecting, but lately I’ve been buying second hand older figures off eBay. And now my Bramble pony is joined by Ivy the pony & Strawberry the Foal!! 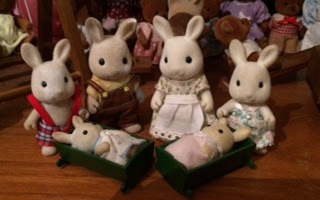 How sweet- love vintage sylvanian finds on eBay!